The online catalogue includes some 550 oil paintings and over 1700 works on paper dating from ca 1850 to 1903. The evolution of each painting from sketch to final oil is described and illustrated, starting with basic information: the title, date, collection, medium, size, and signature. This is followed by accounts of the source of the title and date, identification of the subjects, sitters and sites shown in the paintings, and discussions of technique, medium and support, conservation and frames, and on the exhibition, publication and provenance of each work. Margaret F. MacDonald, Grischka Petri, James McNeill Whistler: The paintings, a catalogue raisonné, University of Glasgow, 2014, on-line website at http://whistlerpaintings.gla.ac.uk. 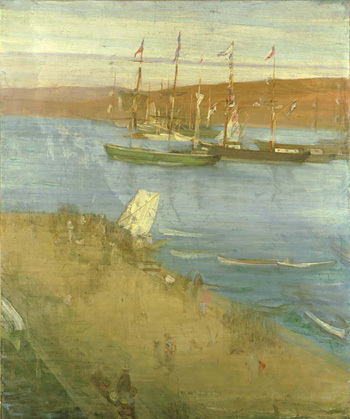 Whistler’s work is in the public domain. Images in this catalogue can be downloaded for personal use. For any other use please contact the copyright holders, or the owner of the work of art or other image reproduced in this catalogue.